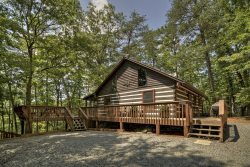 Deer Crossing is an authentic log cabin for your trip to Blue Ridge GA and the North Georgia Mountains. If you are lucky enough to be in the mountains, then you are lucky enough! Property Size 1,235 sq. ft.
Drive through a covered bridge to arrive at this romantic and private Hideaway! Beautifully appointed with cozy mountain decor and antiques, this “Authentic Log Cabin” is nestled in a lovely wooded setting overlooking a peaceful meadow. First floor Master Suite features a King bed with sitting area, wood burning stone fireplace with rocking chairs and. The attached Master Bath boasts a Claw Foot soaking tub. The spacious loft provides a comfy Queen bed, TV with satellite, pull out sofa, foosball table and a full bathroom with shower. The kitchen is well stocked with every thing a chef could want. Watch your favorite program on the 42" HDTV or watch the deer from the 48ft screened porch, complete with sunken Jacuzzi Hot Tub, porch swing and rockers. Everything you need to relax, unwind and enjoy the mountains!